In the short video below, Denis McNamara talks about the nature of beauty, particular in the context of sacred architecture (scroll to the bottom if you want to go straight to it and avoid my comments!) This is the second in the series of 10 which I will be featuring in coming weeks. 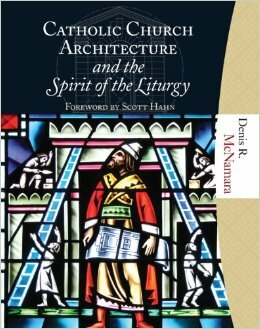 Prof. McNamara is on the faculty of the Liturgical Institute, Mundelein; his book is Catholic Church Architecture and the Spirit of the Liturgy was published in 2009. In this video, he points out that beauty is not simply “in the eye of the beholder,” but is a property of the object itself, the thing that we are judging to be beautiful. He is asserting the principle of objective beauty - beauty that it is in the object percieved; and objecting (if you’ll forgive the pun) to the opposite principle, the idea of subjective beauty, that beauty is simply a matter of the personal taste of the subject who sees the object. He defines beauty as a property of something that “reveals its ontological being.” Another way of putting this was given to me by Dr Caroline Farey of the School of the Annunciation in Devon, England. She defined beauty as the “splendor of being.” Both definitions are telling us that beauty is a property of something that reveals to us what it is. So, in the context of this talk, to be beautiful, a church must look like church. It must appeal to our sense of what a church is. As a bit of supporting anecdotal evidence for the definition that Denis gives: when I was a high school physics teacher in England many years ago, at the end of term I used to present the class with a piece of mechanical equipment made in Victorian times. It had cogs and moving parts exquisitely machined in polished brass. No one in the building knew what it was for, and we couldn’t tell from looking at it what its purpose was (I never found out). Nevertheless, the precision and harmony of the motion of its parts when turned were such that all assumed that it must have one. I would bring this into the classroom and without comment place it down on the table in front of them, letting them look at it for a few moments. Then I would ask the question, “Do you think this is beautiful?” Every time, the response of the students was the same; they didn’t answer Yes or No, but they always asked, “What is it?” These were 17 and 18 year-olds who had never studied aesthetics, at a school in London with no particular Catholic or even Christian connections. Yet these students knew instinctively that they could not answer the question “Is it beautiful?” without knowing what the object was. As I see it, this establishment of principles of beauty should not be interpreted as a way of proving (or disproving) that something is beautiful. Any attempts to create “rules of beauty” to that end will always fall flat. That is not to say that there are no guiding principles, but these are better thought of in the same way as the rules of harmony and counterpoint in music. All beautiful music makes good use of them, but not all music that obeys the rules of harmony and counterpoint is beautiful. There is always an intuitive element that relates to how they are employed that cannot be accounted for definitively when creating beauty; this is what distinguishes a good composer from one who just has technical understanding. In the appreciation of beauty, there is always a subjective element present. This does not compromise the principle of objective beauty, however: some people are able to recognize beauty and some are not. Ultimately, we don’t know for certain who has this ability and who doesn’t. This lack of an ultimate and perfect authority to whom we can appeal in stating definitively means that in the end we rely on the best we have, tradition. Tradition in this context can be thought of as a consensus of the opinions of many people over generations as to what is beautiful and what is not. It is not a perfect guide, and clearly is less reliable the more recent the work of art we are judging, but it is the best we have.